Although not exactly a long weekend for me as the UN still has some meetings during the President Day as well as the Chinese New Year! Happy Chinese New Year to those celebrating it! 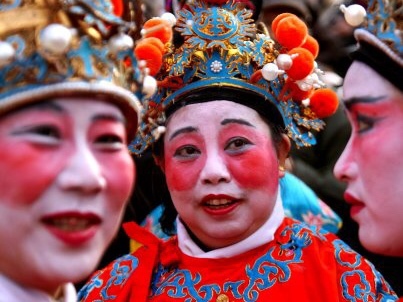 These are some fun photos we took while celebrating the Chinese New Year in Paris back in 2010. Always fascinating to see how colorful the world cultures are! We were traveling with a big group of people,- our big family in Geneve I have to say,- who love photography as well What a fun trip indeed! And I really missed it! I have been using the time to upload some photos on my social media accounts. Well, some photos are taken during our trips dated back in 2016 and apparently untouched! Let alone the stories piling up in my drafts :). Well, I guess I will have to do them one draft at a time! It's not easy to juggle between my family and kids, full-time job, and appealing New York City! So much to, so little time. Especially as I'm counting down to going back home to Indonesia this summer. Do you sometimes feel the same way? Like you don't wanna miss anything but you know you are tired and just need to pause for a bit. Well, I bet I will soon work it out! Anyway, now I'm ready, willing and able to invite you to our Weekly Linky Party, Wonderful Wednesday with Oh My Hearts Girls. Here it is! all the luck and prosperity in the years to come! Selamat imlek mbak dan buat semua yang merayakan. Meriah bangat tach perayaan disana. aku thn ini sama sekali nga hunting foto perayaan imlek, cuacanya jelek pada sakit beberapa hari. 7 draft tertahan dashboard, sementara kerjaan di kantor menumpuk, di rumah keluarga jadi prioritas, sementara badah lelah dan letih. Hiksss. Curhat juga deh aku Mbak. That really looks like it was fun! I bet it took a long time to put all the makeup on. It's so cool though! What a fun event! Saya suka dengan ular naganya. It looks fun ma! those costumes! Happy Chinese New Year! Dog Year is my year too.